It was previously reported that the set of Netflix's House of Cards was on lockdown due to a mass shooting within close proximity to the set, but according to Netflix, the shooting did not impact the set at all. 5 people were shot and 3 were killed in a Maryland business park about a mile from the set of House of Cards and as of this writing, the shooter is still at large. A report went out earlier saying that attack was "targeted" and that it had suspended production of the hit Netflix series. The Hollywood Reporter reveals that despite the ongoing FBI manhunt for the gunman, that the set of House of Cards has not been impacted. A statement from Netflix revealed that they had been in touch with authorities and that everything was okay on their end. The statement reads. "We have been in touch with local authorities and are aware of a shooting situation that happened about a mile away from the House of Cards set. Production on the show has not been impacted." Executive producer Dana Brunetti first shared the news that the shooting was near the set on his social media account before the mainstream media had picked up on the story. "There is an ongoing active shooter near the House of Cards stage and ZERO coverage," he wrote. Dana Brunetti has been asked to talk to CNN regarding other news tied into the hit Netflix series. According to news reports, the shooting occurred just before 9 AM at Advanced Granite Solutions, and sheriff's deputies were on the scene within 4 minutes, according to Sheriff Jeffrey Gahler. All five people were shot with a handgun, and are employees of the business, Gahler said. The suspect fled the scene of the crime and is still on the run from law enforcement. 2 of the patients who were shot remain to be in critical condition after the attack. This is the second time that House of Cards has come up in the news recently as it had been previously reported that Russian trolls watched the show, among others, to prepare for a targeted social media attack in an attempt to influence Americans against their own government. The independent Russian TV station, Rain, interviewed an agency worker identified as "Maksim" who said the troll factory, formerly known as the Internet Research Agency, targeted Americans in the comments section of popular websites with messages slamming Hillary Clinton about her family's past scandals as well as the scandal of her private email server. 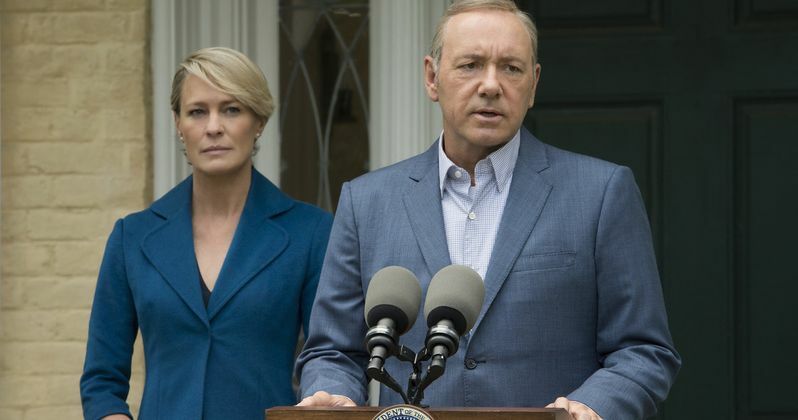 House of Cards, starring Kevin Spacey and Robin Wright, released its 5th Season in May and is currently in the middle of shooting for Season 6. The news comes at a time where Netflix has not officially signed on to officially renew the hit political thriller series. You can read more about the shooting and the production of Season 6 of House of Cards courtesy of The Hollywood Reporter.